UPDATE @ 2.10pm: Two Gold Coast men and a Brisbane man have fronted court, charged with the murder of a 33-year-old Brisbane man. Thomas Appleby, 21, was arrested on Sunday, while 23-year-old Damian Marco Markovski and 29-year-old James Torralba were arrested on Monday. All three men were refused bail, and will remain behind bars until their next court appearance on February 4. Outside court, Appleby’s lawyer Victoria Ward said her client would be fighting the charges. EARLIER @9.00am: TWO more men have been charged with the murder of a Brisbane man who was found dead in his home on Friday afternoon. The body of Robert Charles Frescon, 33, was found inside his Kelvin Grove property by members of his family around 3pm on January 18. It’s understood the man’s sister became concerned after he failed to show up to work. Following investigations into the man’s death, a 21-year-old Broadbeach man was arrested and charged with murder on Sunday. Police revealed in a statement that a post-mortem examination confirmed Mr Frescon died as a result of a wound to his neck. Two other men, a 23-year-old Broadbeach man and a 29-year-old St Lucia man, were also arrested by homicide detectives overnight and charged with one count each of murder. The trio are all due to appear in the Brisbane Magistrates Court this morning. One of the Gold Coast’s most loved food and music venues has announced it will be closing its iconic container doors after failing to reach an agreement with its landlord over a massive rental increase. NightQuarter owners Michelle Christoe and Ian Van der Woude broke the sad news to locals overnight, revealing they are “bitterly disappointed” they couldn’t reach a compromise with SCentre, the owners and operators of Westfield Australia and New Zealand. “We had an agreement for an extended term at the site subject to agreement on revised rent,” Mr Van der Woude said. “The landlord was seeking more than double the rent for an extended five-year term. 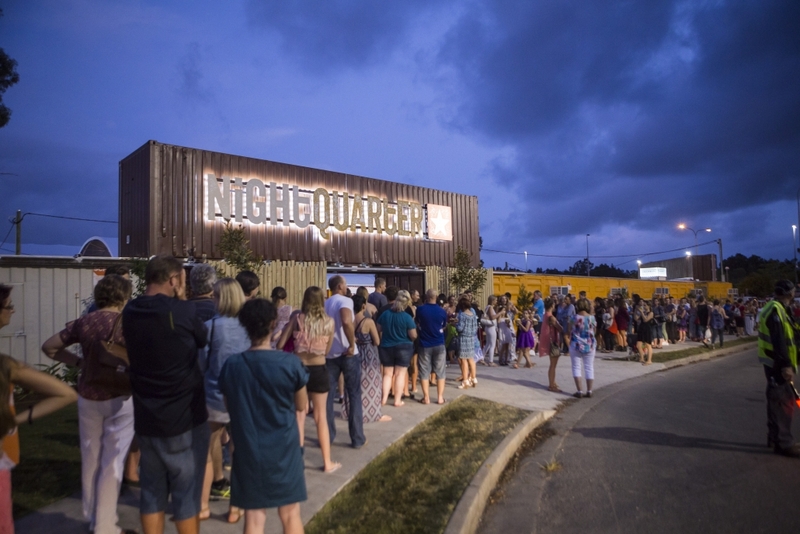 The husband and wife duo said that for NightQuarter to accept the higher rent under the new agreement, they would have to pass on increases of over double to their vendors, which they didn’t want to do. “We looked at all the options, but in the end we needed to make a decision that was in the best interest of the company, our employees and our community of stallholders. We would have gone broke if we accepted what Scentre were offering,” they said. Before making their decision, Ms Christoe and Mr Van der Woude searched extensively for an alternate site on the Gold Coast; but have not yet been able to secure anything suitable. “My husband, Ian and I have been actively seeking out alternative options to relocate NightQuarter and have looked at quite a few sites. We are hopeful to be able to secure a new site in the very near future,” Ms Christoe said. Following the announcement, thousands of locals took to social media to express their disappointment. “What an absolute shame for the northern Gold Coast! Such a great family friendly venue with entertainment for everyone,” one person commented. “This is just sad news. Night Quarter you have given so much to the Gold Coasts food, entertainment and creative community. Here is to coming back bigger and even more spectacular,” wrote another. The highly successful NightQuarter Helensvale opened in November 2015 and has since hosted a range of major touring acts including RUFUS, Amy Shark, The Cat Empire, Sticky Fingers, Pete Murray, Simple Plan, The Living End, The Presets, Illy and more. NightQuarter will continue to operate until 1 February 2019, where they will close with pop band UB40. Get excited Gold Coasters, because it looks like we might be boarding the city’s first ever ferry service by Christmas this year. Acting Gold Coast Mayor Donna Gates said council will learn more about the Gold Coast’s much-anticipated ferry service trial at a full council meeting in March. During the meeting, it’s understood Councillors will be presented with a report on likely vessel speeds, jetty upgrades, passenger stop locations and logistics. The ferry service, dubbed “light-rail-on-water”, will see solar-powered catamarans travel between Labrador and Evandale with a plan to also have ferries travel as far as Metricon Stadium on event days. Ms Gates said the city was doing everything it can to reduce traffic congestion on the Gold Coast. “Road upgrades are the No 1 priority but we will continue to explore every aspect we can, including this two-year ferry trial,” she said. RELATED: Gold Coast ferry service a step closer to reality. LATEST @ 15 January, 6.30 AM | POLICE investigating a suspicious house fire at Ashmore where obscene graffiti was found spray painted on a back wall are appealing for help from the public. The blaze erupted at a house on the corner of Baleh Street and Mingaletta Drive in Ashmore just after 8.00am on Monday. The resident of the home, a 46-year-old man, was not home at the time however soon returned to find all of his belongings destroyed after receiving a number of calls and messages from worried neighbours. The fire then quickly spread to the nearby house, causing significant damage to its interior and destroying the vehicle, along with a jet-ski. 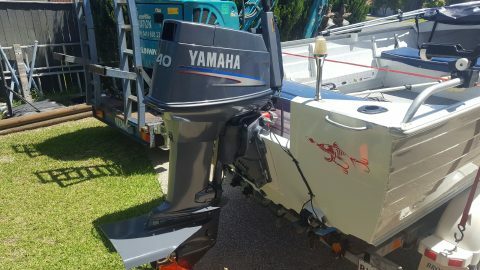 It’s believed a boat was also stolen from the property around the time of the blaze, with police appealing for anyone who may have seen a vehicle driving in the area between 7.00am and 8.00am towing a tinnie on a boat trailer with QLD registration BV4987 to come forward. Upon inspection of the home, the words “this is for f—ing my wife” were found spray painted on a wall outside. EARLIER @ January 14, 11.45 AM | POLICE are treating a fire which destroyed a house and ute on the Gold Coast this morning as suspicious. The blaze erupted at a property on the corner of Baleh Street and Mingaletta Drive in Ashmore just after 8.00am. The fire then quickly spread to the nearby home, causing significant damage to its interior and destroying the vehicle. The resident of the property, a 46-year-old man, was not home at the time. A boat, trailer and possibly a moped are also believed to have been stolen from the residence. EARLIER @ 9.00 AM | FIRE crews are currently on scene of a ferocious house and car fire on the Gold Coast. Four Queensland Fire and Rescue crews are working to extinguish the flames, with a spokesperson confirming the property was “well involved” when fire crews arrived. One person was assessed by Queensland Ambulance for minor smoke inhalation and treated at the scene, but did not require transport to hospital. A Queensland Ambulance crew remains on standby for firefighters. Seven people have been hospitalised after a tour bus rolled 20 metres down an embankment in the Gold Coast hinterland overnight. The bus, which had 19 passengers on board, crashed off Lamington National Park Road, near O’Reilly’s Rainforest, just after 8.00pm on Sunday. It’s understood a number of tourists were on their way to the glow worm cave when the accident happened. The driver of the bus, a man in his 20s, was stuck in the vehicle for more than two hours as Queensland Fire and Rescue crews, along with police and paramedics, desperately worked to secure the bus and free the man. He was eventually freed and flown to Gold Coast University Hospital in a serious but stable condition with pelvic and abdominal injuries. Queensland Ambulance said all other passengers managed to escape, with six receiving treatment by paramedics at the nearby O’Reilly’s Rainforest Retreat. They were then transported to Gold Coast University Hospital with various minor injuries, including glass cuts and seat belt injuries. Final update for bus rollover at #Oreilly. One patient transported by helicopter to Gold Coast University Hospital with moderate injuries. 6 other patients with minor injuries transported by road to Gold Coast University Hospital.